Step 1: Scroll down and look to the lower left side of the order for "Duplicate." Step 2: The page that opens will look like the order create page with all of the signing information already added. There are three check boxes at the top that you can use to choose whether you'd like to include the same documents, assign the same notary and/or notify the client of the duplicated order. Select a new date and time for the order and then save. 1) If you need to pay the notary a print/travel fee, adjust the notary fees to reflect what the notary is owed and then close the order. 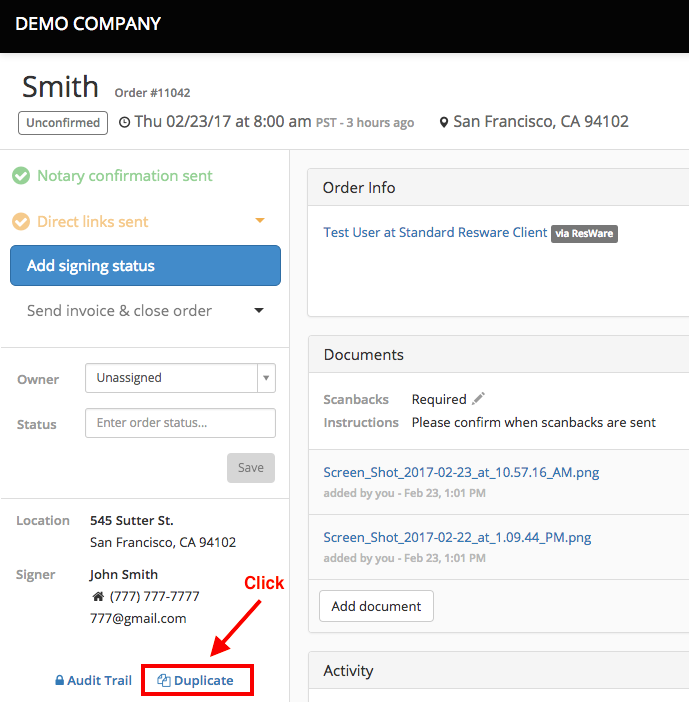 If you are on VendorPay, Snapdocs will not charge for orders that didn't sign (meaning the signing status is marked as "did not sign"). If you are not on VendorPay, you will still be charged the Snapdocs fee for orders marked as Did Not Sign. 2) If the notary is not due payment, simply cancel the order. Snapdocs does not charge for canceled orders, whether you are on VendorPay or not. 3) If you are still figuring out whether the notary is due payment, put the order on hold so that it does not get billed. The order will not be billed until it has a signing status added and the order is closed, for both VendorPay and non-VendorPay orders.